Dunhill may not be the sexiest brand on the market. Owned by British American Tobacco and made and distributed by General Cigar Co., you could argue Dunhill is somewhat neglected by the online cigar community, gets lost in General’s portfolio of more visible brands, and hasn’t lived up to its rich legacy. That legacy pre-dates the communist takeover of Cuba, when the Dunhill shop in London had exclusive marketing and distribution agreements with various Cuban cigar makers, including Montecristo, Romeo y Julieta, and Partagas. Since then, Dunhill has bounced around with cigars by Toraño and Altadis, finally settling under the General Cigar umbrella. In 2015, to commemorate the 80th anniversary of its Selección Suprema series (which kicked off in 1935 with a cigar called Don Candido), Dunhill released a special limited edition cigar called Signed Range Selección Suprema. Only 20,000 total cigars were made in a single vitola, a toro (6 x 50); they are packaged in display-friendly boxes of 8 and retail for $20 apiece. Signed Range Selección Suprema is made at the General Cigar Dominicana factory with a Nicaraguan Jalapa wrapper, Connecticut Broadleaf binder, and filler tobaccos from Nicaragua (Estelí and Jalapa) and Brazil (Mata Fina). It sports three bands of black and metallic bronze, including one at the foot. Underneath is a mottled, oily leaf that’s traversed by a network of thin veins. The pre-light notes at the foot are subtle and characterized by hints of honey and sawdust. The cap clips easily to reveal and smooth cold draw. Once an even light is set, the preliminary flavor is a medium-bodied combination of leather, damp earth, salted caramel, and oak. The texture is buttery and the resting smoke gives off a creamy sweetness that is, frankly, much more enticing than the actual flavor, which I find a little flat. Things pick up nicely after a half-inch or so, however. That’s where the smoke production kicks into gear and the taste becomes mouth-wateringly velvety and balanced. The damp earth takes a back seat to more intense flavors of gentle spice, citrus, and sugar. This profile remains mostly consistent throughout, save for the additions of coffee and dark chocolate in the finale. 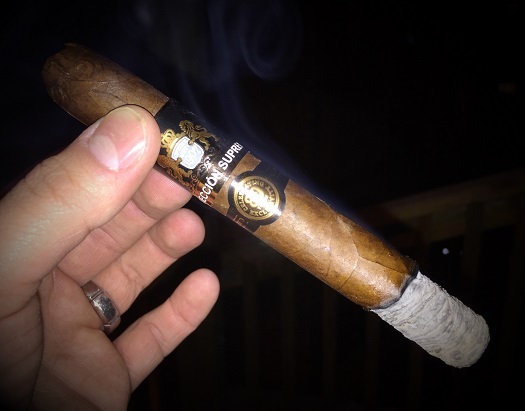 As I’ve come to expect from General Cigar—and as everyone should expect from any cigar with a super-premium price tag—the cigar has exquisite construction. The burn line is excellent, the draw easy, the smoke production good, and the ash is well-behaved and finely layered. While I’ll admit I don’t smoke many Dunhills, I can easily say this is the best I’ve had. Sure, it’s also the most expensive. Price aside, though, you can’t deny this toro’s complexity and balance. If you decide to pony up the cash, you won’t be disappointed. The Dunhill Signed Range Selección Suprema earns four stogies out of five.